Sometimes government is as plain as the snow on your street. Essential services—a catchall category that includes plowing, traffic lights, and bou­levard maintenance, as well as police and fire—is one of local government’s most visible and vital functions. Few people dispute that these services are central to making a city safe, inviting, and livable. But who should pay the bill? Beginning in 2002, all property owners shared the burden by paying a “right-of-way fee.” In 2016, though, the Minnesota Supreme Court ruled that churches, museums, hospitals, colleges, and other tax-exempt organizations could no longer be assessed that fee, deeming it a tax obscured only by name. In 2016, the right-of-way revenue totaled $30.3 million, with $4.5 million assessed on tax-exempt properties. The courts decided that nonprofits should continue to pay for street lighting and alley maintenance. But that still left $1.8 million in services costs that could not be billed to those owners. Residential and for-profit businesses now make up the difference. City leaders, facing objections by those property owners, were curious to know whether another strategy might enable nonprofits to help compensate for the services they receive. In the summer of 2017, with support from The Saint Paul & Minnesota Community Foundations, the Citizens League ran a nine-week study committee to find out. The Citizens League invited Kaye Rakow, former director of public policy for the Minnesota chapter of the Commercial Real Estate Development Association, and Joe Reid, former St. Paul budget director, to come out of retirement and cochair a com­mittee to explore whether a PILOT, or “pay­ment in lieu of taxes,” program might work for St. Paul. “At first, I didn’t understand why a committee was even needed. Why couldn’t the city just call up these property owners and talk to them?” recalls Rakow. At second glance, she quickly saw the complexities of the situation and was drawn to help. Rakow and Reid had never met before, but they shared a background in numbers wizardry and committee work made them an effective team. For four months, the cochairs led a 23-person committee that included representatives from nonprofits and property owners, both commercial and residential. Former Citizens League executive director Sean Kershaw, Min­nesota Center for Fiscal Excellence exec­utive director Mark Haveman, and two research interns lent additional support. Others, such as the St. Paul Federation of Teachers, observed the proceedings—en masse and in matching T-shirts. In other cities, PILOT programs have been a way for nonprofits to contribute—symboli­cally, at least—to the budget that helps protect and maintain their real estate. It’s a delicate ask in any situation, of course, as some nonprofits are more able or willing to contribute than others. 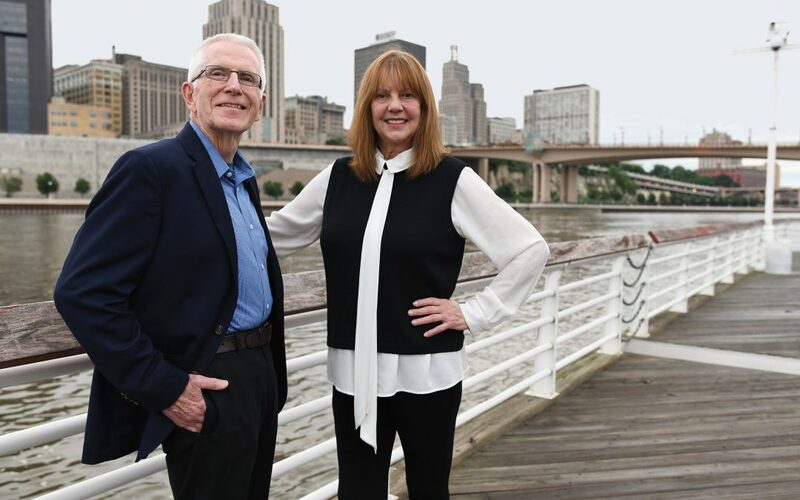 And in St. Paul specifically, the commit­tee found, relationships between the city and its nonprofits had been somewhat strained. Municipal officials routinely fielded citizen concerns about nonprofits on a range of issues, including parking availability (or lack thereof) in residential neighborhoods and the presence of at-risk clients like the homeless, and general complaints from those who object to paying for services they might not personally use or value. At the same time, nonprofits routinely felt underappreciated. Service organizations took issue with the notion that their budgets should be impacted by costs that weren’t di­rectly related to their mission or clients. Each week, the committee presented data about St. Paul’s real estate and budget. Nonprofits shared their perspectives. Outside experts, such as representatives from the City of Boston and the Lincoln Institute of Land Policy, explained how other cities have faced the same conun­drum. Seeing numbers brought new clarity. For one thing, a much-repeated figure came into focus, and changed. The committee had been told that a third of St. Paul’s property was tax ex­empt, the highest percentage of any city in the state. In reality, when the committee analyzed the data, they found that 23.4 percent of the city’s property belonged to nonprofits, which is similar to other larg­er cities in the state. In fact, Minneapolis has an even higher percentage (23.9). Raw data didn’t tell the whole story, however. The nonprofits on the committee explained that they already made contri­butions. Como Zoo, the Ordway, colleges, hospitals, parks, and other organizations do more than elevate St. Paul’s cultural land­scape; they generate economic activity or relieve taxpayers of certain burdens—even though it’s difficult to assign a dollar value to these contributions. Reid agrees. “It’s more difficult to com­promise between different points of view than it was in the past. It’s a challenge for all of us, in our families, church, and neighborhoods. People need to learn how to listen to one another, take care of each other, and respect each other again. In fall 2017, the Citizens League’s PILOT committee wrapped up its study with presen­tations to then mayor Chris Coleman and the St. Paul City Council. They shared the data the committee had gathered and then made recommendations. A PILOT program could not be counted on to completely solve the budget issues facing the city, the commit­tee found. However, the city could still ask nonprofits to contribute something toward the services that benefit them and their clients. As a first step, though, the city must improve its relationships with its nonprofits. And then there was an election. “The new mayor and city council will have to address some difficult questions. I hope our commit­tee’s work helps with that,” Reid says. Amy Goetzman is a writer and editor. Her work—which focuses on the arts, culture, technology, and environmental issues—appears in MinnPost, Architecture MN, and the Star Tribune.